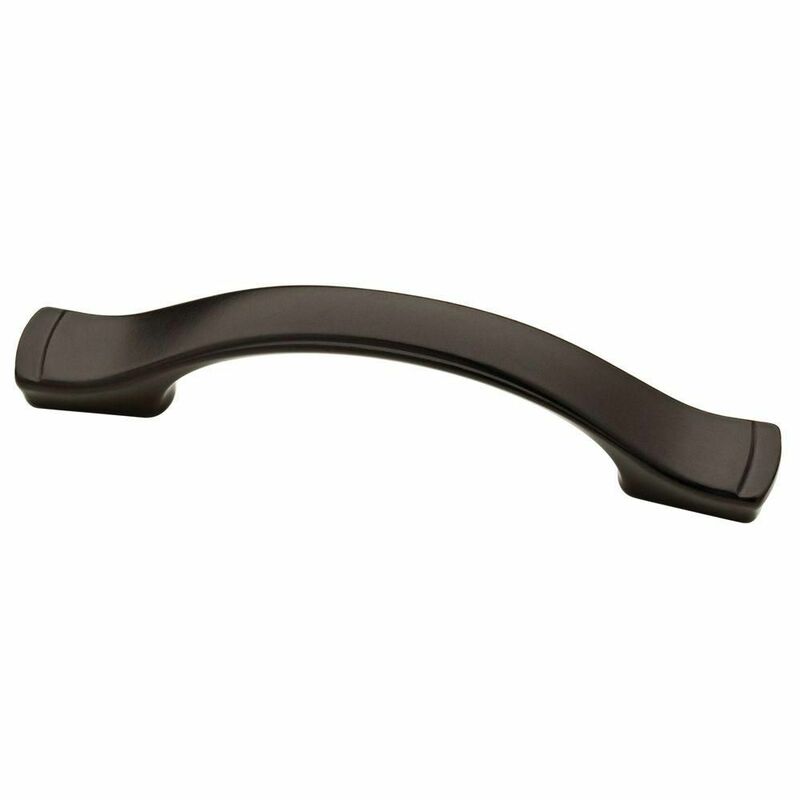 From Liberty Hardware, the Step Edge Pull is a classic design that will complement traditional or casual style cabinetry or furniture. Crafted from die-cast zinc for long lasting quality and durability. Installation hardware is included and multiple finishes are available. Consider using the Liberty French Romantics Collection 3 in. Bronze with Copper Highlights Dual-Mount Channel Pull to accent your kitchen's cabinetry or furniture. This pull is made of die-cast zinc. This pull includes hardware for an easy installation. Casual style design. Poly bag with 8-32 x 1 in. machine screw included. Easy to install. Bring a contemporary look to your kitchen or bathroom cabinetry with the Liberty 3 in. Arched Pull. This elegant piece of hardware is constructed from high-quality zinc die-cast base material built to withstand the toughest environments. The satin nickel finish along with the clean lines and sleek curves gives this pull that designer look. The Liberty 3 in. Arched Pull features 3 in. center-to-center rear mounting. Add a sense of class and elegance to your kitchen or bathroom cabinetry with the Liberty Cameron 3 in. Pull. With its contemporary design and premium finish this pull is sure to bring life to any room that displays it. The high-quality zinc die cast base material enables this piece of hardware to be enjoyed for years. The Liberty 3 in. Cameron Pull features 3 in. center-to-center rear mounting. Provide a little character to your kitchen or bathroom cabinetry when you display the Liberty Collins 3 in. Pull. The oval foot base along with the subtle, yet classy three-ringed design makes this pull a truly unique piece of hardware sure to complement any decor. Being constructed of high-quality zinc die cast base material allows this pull to withstand even the toughest environments. The Liberty Collins 3 in. Pull features 3 in. center-to-center rear mounting. 3 or 3-3/4 Dual Mount Step Edge Pull, 1 per package From Liberty Hardware, the Step Edge Pull is a classic design that will complement traditional or casual style cabinetry or furniture. Crafted from die-cast zinc for long lasting quality and durability. Installation hardware is included and multiple finishes are available. 3 or 3-3/4 Dual Mount Step Edge Pull, 1 per package is rated 4.5 out of 5 by 30. Rated 1 out of 5 by MyName from Less than a year and the black finish has chipped off of all of them. These were not cheap. I cou... Less than a year and the black finish has chipped off of all of them. These were not cheap. I could have a more durable finish using spray paint. We are a family of 3 and wear no rings, this is happening on all pulls not just ones that are frequently used. Rated 4 out of 5 by Connie from So far ok. Have not been used yet. Had to... So far ok. Have not been used yet. Had to return several because paint was bubbled or chipped. Hoping this isn’t an indication of how they’ll wear. Rated 5 out of 5 by Kristin from Good sturdy quality looking handles. ... Good sturdy quality looking handles.